The Greco-Persian Wars (also often called the Persian Wars) were a series of conflicts between the Achaemenid Empire and Greek city-states that started in 499 BCi[›] and lasted until 449 BC. The collision between the fractious political world of the Greeks and the enormous empire of the Persians began when Cyrus the Great conquered the Greek-inhabited region of Ionia in 547 BC. Struggling to rule the independent-minded cities of Ionia, the Persians appointed tyrants to rule each of them. This would prove to be the source of much trouble for the Greeks and Persians alike. In 499 BC, the tyrant of Miletus, Aristagoras, embarked on an expedition to conquer the island of Naxos, with Persian support; however, the expedition was a debacle and, preempting his dismissal, Aristagoras incited all of Hellenic Asia Minor into rebellion against the Persians. 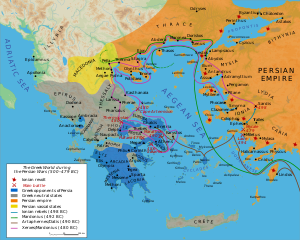 This was the beginning of the Ionian Revolt, which would last until 493 BC, progressively drawing more regions of Asia Minor into the conflict. Aristagoras secured military support from Athens and Eretria, and in 498 BC these forces helped to capture and burn the Persian regional capital of Sardis. The Persian king Darius the Great vowed to have revenge on Athens and Eretria for this act. The revolt continued, with the two sides effectively stalemated throughout 497–495 BC. In 494 BC, the Persians regrouped, and attacked the epicentre of the revolt in Miletus. At the Battle of Lade, the Ionians suffered a decisive defeat, and the rebellion collapsed, with the final members being stamped out the following year. Seeking to secure his empire from further revolts and from the interference of the mainland Greeks, Darius embarked on a scheme to conquer Greece and to punish Athens and Eretria for the burning of Sardis. The first Persian invasion of Greece began in 492 BC, with the Persian general Mardonius successfully re-subjugating Thrace and Macedon before several mishaps forced an early end to the rest of the campaign. In 490 BC a second force was sent to Greece, this time across the Aegean Sea, under the command of Datis and Artaphernes. This expedition subjugated the Cyclades, before besieging, capturing and razing Eretria. However, while en route to attack Athens, the Persian force was decisively defeated by the Athenians at the Battle of Marathon, ending Persian efforts for the time being. Darius then began to plan to completely conquer Greece, but died in 486 BC and responsibility for the conquest passed to his son Xerxes. In 480 BC, Xerxes personally led the second Persian invasion of Greece with one of the largest ancient armies ever assembled. Victory over the allied Greek states at the famous Battle of Thermopylae allowed the Persians to torch an evacuated Athens and overrun most of Greece. However, while seeking to destroy the combined Greek fleet, the Persians suffered a severe defeat at the Battle of Salamis. The following year, the confederated Greeks went on the offensive, decisively defeating the Persian army at the Battle of Plataea, and ending the invasion of Greece by the Achaemenid Empire. The allied Greeks followed up their success by destroying the rest of the Persian fleet at the Battle of Mycale, before expelling Persian garrisons from Sestos (479 BC) and Byzantium (478 BC). Following the Persian withdrawal from Europe and the Greek victory at Mycale, Macedon and the city states of Ionia regained their independence. The actions of the general Pausanias at the siege of Byzantium alienated many of the Greek states from the Spartans, and the anti-Persian alliance was therefore reconstituted around Athenian leadership, called the Delian League. The Delian League continued to campaign against Persia for the next three decades, beginning with the expulsion of the remaining Persian garrisons from Europe. At the Battle of the Eurymedon in 466 BC, the League won a double victory that finally secured freedom for the cities of Ionia. However, the League's involvement in the Egyptian revolt by Inaros II against Artaxerxes I (from 460–454 BC) resulted in a disastrous defeat, and further campaigning was suspended. A Greek fleet was sent to Cyprus in 451 BC, but achieved little, and, when it withdrew, the Greco-Persian Wars drew to a quiet end. Some historical sources suggest the end of hostilities was marked by a peace treaty between Athens and Persia, the Peace of Callias. Almost all the primary sources for the Greco-Persian Wars are Greek; there are no surviving historical accounts from the Persian side. By some distance, the main source for the Greco-Persian Wars is the Greek historian Herodotus. Herodotus, who has been called the "Father of History", was born in 484 BC in Halicarnassus, Asia Minor (then part of the Persian empire). He wrote his 'Enquiries' (Greek Historia, English (The) Histories) around 440–430 BC, trying to trace the origins of the Greco-Persian Wars, which would still have been recent history. Herodotus's approach was novel and, at least in Western society, he invented 'history' as a discipline. As historian Tom Holland has it, "For the first time, a chronicler set himself to trace the origins of a conflict not to a past so remote so as to be utterly fabulous, nor to the whims and wishes of some god, nor to a people's claim to manifest destiny, but rather explanations he could verify personally." The cities of Ionia remained independent until they were conquered by the Lydians of western Asia Minor. The Lydian king Alyattes attacked Miletus, a conflict that ended with a treaty of alliance between Miletus and Lydia, that meant that Miletus would have internal autonomy but follow Lydia in foreign affairs. At this time, the Lydians were also in conflict with the Median Empire, and the Milesians sent an army to aid the Lydians in this conflict. Eventually a peaceable settlement was established between the Medes and the Lydians, with the Halys River set up as the border between the kingdoms. The famous Lydian king Croesus succeeded his father Alyattes in around 560 BC and set about conquering the other Greek city states of Asia Minor. The Persian prince Cyrus led a rebellion against the last Median king Astyages in 553 BC. Cyrus was a grandson of Astyages and was supported by part of the Median aristocracy. By 550 BC, the rebellion was over, and Cyrus had emerged victorious, founding the Achaemenid Empire in place of the Median kingdom in the process. Croesus saw the disruption in the Median Empire and Persia as an opportunity to extend his realm and asked the oracle of Delphi whether he should attack them. The Oracle supposedly replied the famously ambiguous answer that "if Croesus was to cross the Halys he would destroy a great empire". Blind to the ambiguity of this prophecy, Croesus attacked the Persians, but was eventually defeated and Lydia fell to Cyrus. By crossing the Halys, Croesus had indeed destroyed a great empire – his own. In the years following their conquest, the Persians found the Ionians difficult to rule. Elsewhere in the empire, Cyrus identified elite native groups such as the priesthood of Judea – to help him rule his new subjects. No such group existed in Greek cities at this time; while there was usually an aristocracy, this was inevitably divided into feuding factions. The Persians thus settled for sponsoring a tyrant in each Ionian city, even though this drew them into the Ionians' internal conflicts. Furthermore, certain tyrants might develop an independent streak and have to be replaced. The tyrants themselves faced a difficult task; they had to deflect the worst of their fellow citizens' hatred, while staying in the favour of the Persians. In the past, Greek states had often been ruled by tyrants, but that form of government was on the decline. Past tyrants had also tended and needed to be strong and able leaders, whereas the rulers appointed by the Persians were simply place-men. Backed by Persian military might, these tyrants did not need the support of the population, and could thus rule absolutely. On the eve of the Greco-Persian wars, it is probable that the Ionian population had become discontented and was ready for rebellion. 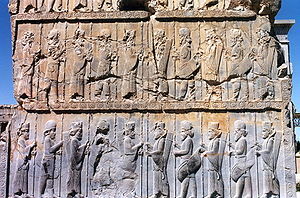 The Persian military consisted of a diverse group of men drawn across the various nations of the empire. 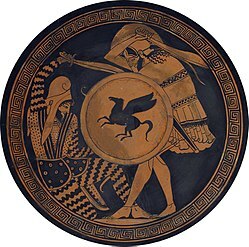 However, according to Herodotus, there was at least a general conformity in armor and style of fighting. The troops were usually armed with a bow, a 'short spear' and a sword or axe, and carried a wicker shield. They wore a leather jerkin, although individuals of high status wore high-quality metal armor. The Persians most likely used their bows to wear down the enemy, then closed in to deliver the final blow with spears and swords. The first rank of Persian infantry formations, the so-called 'sparabara', had no bows, carried larger wicker shields and were sometimes armed with longer spears. Their role was to protect the back ranks of the formation. The cavalry probably fought as lightly armed missile cavalry. According to Herodotus, the Athenians, hoping for protection against Sparta, made the gift of "Earth and Water" to the Persians in 507 BC. In 507 BC, Artaphernes, as brother of Darius I and Satrap of Asia Minor in his capital Sardis, received an embassy from newly democratic Athens, probably sent by Cleisthenes, which was looking for Persian assistance in order to resist the threats from Sparta. Herodotus reports that Artaphernes had no previous knowledge of the Athenians, and his initial reaction was "Who are these people?". Artaphernes asked the Athenians for "Water and Earth", a symbol of submission, if they wanted help from the Achaemenid king. The Athenians ambassadors apparently accepted to comply, and to give "Earth and Water". Artaphernes also advised the Athenians that they should receive back the Athenian tyrant Hippias. The Persians threatened to attack Athens if they did not accept Hippias. Nevertheless, the Athenians preferred to remain democratic despite the danger from Persia, and the ambassadors were disavowed and censured upon their return to Athens. The Athenians despatched envoys to Sardis, desiring to make an alliance with the Persians; for they knew that they had provoked the Lacedaemonians and Cleomenes to war. When the envoys came to Sardis and spoke as they had been bidden, Artaphrenes son of Hystaspes, viceroy of Sardis, asked them, "What men are you, and where dwell you, who desire alliance with the Persians?" Being informed by the envoys, he gave them an answer whereof the substance was, that if the Athenians gave king Darius earth and water, then he would make alliance with them; but if not, his command was that they should begone. The envoys consulted together and consented to give what was asked, in their desire to make the alliance. So they returned to their own country, and were then greatly blamed for what they had done. There is a possibility that the Achaemenid ruler now saw the Athenians as subjects who had solemnly promissed submission through the gift of "Earth and Water", and that subsequent actions by the Athenians, such as their intervention in the Ionian revolt, were perceived as a break of oath, and a rebellion to the central authority of the Achaemenid ruler. 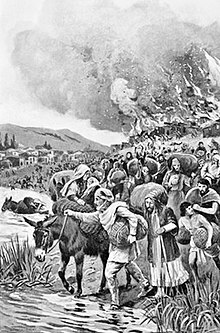 The burning of Sardis by the Greeks and the Ionians during the Ionian Revolt in 498 BC. The first campaign, in 492 BC, was led by Darius's son-in-law Mardonius, who re-subjugated Thrace, which had nominally been part of the Persian empire since 513 BC. Mardonius was also able to force Macedon to become a fully subordinate client kingdom of Persia; it had previously been a vassal, but retained a broad degree of autonomy. 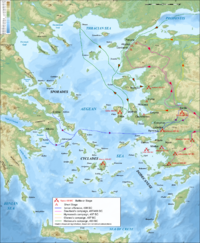 However, further progress in this campaign was prevented when Mardonius's fleet was wrecked in a storm off the coast of Mount Athos. Mardonius himself was then injured in a raid on his camp by a Thracian tribe, and after this he returned with the rest of the expedition to Asia. In 490 BC, Datis and Artaphernes (son of the satrap Artaphernes) were given command of an amphibious invasion force, and set sail from Cilicia. The Persian force sailed first to the island of Rhodes, where a Lindian Temple Chronicle records that Datis besieged the city of Lindos, but was unsuccessful. The fleet sailed next to Naxos, to punish the Naxians for their resistance to the failed expedition the Persians had mounted there a decade earlier. Many of the inhabitants fled to the mountains; those that the Persians caught were enslaved. The Persians then burnt the city and temples of the Naxians. The fleet then proceeded to island-hop across the rest of the Aegean on its way to Eretria, taking hostages and troops from each island. The Persian fleet next headed south down the coast of Attica, landing at the bay of Marathon, roughly 40 kilometres (25 mi) from Athens. Under the guidance of Miltiades, the general with the greatest experience of fighting the Persians, the Athenian army marched to block the two exits from the plain of Marathon. Stalemate ensued for five days, before the Persians decided to continue onward to Athens, and began to load their troops back onto the ships. After the Persians had loaded their cavalry (their strongest soldiers) on the ships, the 10,000 Athenian soldiers descended from the hills around the plain. The Greeks crushed the weaker Persian foot soldiers by routing the wings before turning towards the centre of the Persian line. The remnants of the Persian army fled to their ships and left the battle. Herodotus records that 6,400 Persian bodies were counted on the battlefield; the Athenians lost only 192 men. 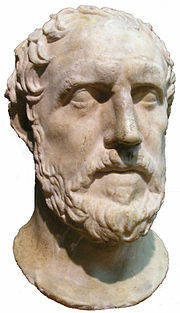 The politician Themistocles, with a power base firmly established amongst the poor, filled the vacuum left by Miltiades's death, and in the following decade became the most influential politician in Athens. 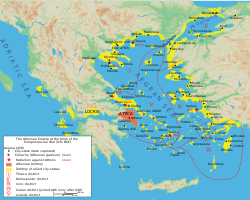 During this period, Themistocles continued to support the expansion of Athens' naval power. The Athenians were aware throughout this period that the Persian interest in Greece had not ended, and Themistocles's naval policies may be seen in the light of the potential threat from Persia. Aristides, Themistocles's great rival, and champion of the zeugites (the 'upper hoplite-class') vigorously opposed such a policy. Victory at Thermopylae meant that all Boeotia fell to Xerxes; Attica was then open to invasion. The remaining population of Athens was evacuated, with the aid of the Allied fleet, to Salamis. The Peloponnesian Allies began to prepare a defensive line across the Isthmus of Corinth, building a wall, and demolishing the road from Megara, abandoning Athens to the Persians. Athens thus fell to the Persians; the small number of Athenians who had barricaded themselves on the Acropolis were eventually defeated, and Xerxes then ordered the Destruction of Athens. Spartans fighting against Persian forces at the Battle of Plataea. 19th century illustration. In 478 BC, still operating under the terms of the Hellenic alliance, the Allies sent out a fleet composed of 20 Peloponnesian and 30 Athenian ships supported by an unspecified number of allies, under the overall command of Pausanias. According to Thucydides, this fleet sailed to Cyprus and "subdued most of the island". Exactly what Thucydides means by this is unclear. Sealey suggests that this was essentially a raid to gather as much treasure as possible from the Persian garrisons on Cyprus. There is no indication that the Allies attempted to take possession of the island, and, shortly after, they sailed to Byzantium. Certainly, the fact that the Delian League repeatedly campaigned in Cyprus suggests either that the island was not garrisoned by the Allies in 478 BC, or that the garrisons were quickly expelled. Pausanias returned to Byzantium as a private citizen in 477 BC, and took command of the city until he was expelled by the Athenians. He then crossed the Bosporus and settled in Kolonai in the Troad, until he was again accused of collaborating with the Persians and was recalled by the Spartans for a trial after which he starved himself to death. The timescale is unclear, but Pausanias may have remained in possession of Byzantium until 470 BC. Towards the end of the 460s BC, the Athenians took the ambitious decision to support a revolt in the Egyptian satrapy of the Persian empire. Although the Greek task force achieved initial successes, they were unable to capture the Persian garrison in Memphis, despite a three-year long siege. The Persians then counterattacked, and the Athenian force was itself besieged for 18 months, before being wiped out. This disaster, coupled with ongoing warfare in Greece, dissuaded the Athenians from resuming conflict with Persia. In 451 BC however, a truce was agreed in Greece, and Cimon was then able to lead an expedition to Cyprus. However, while besieging Kition, Cimon died, and the Athenian force decided to withdraw, winning another double victory at the Battle of Salamis-in-Cyprus in order to extricate themselves. This campaign marked the end of hostilities between the Delian League and Persia, and therefore the end of the Greco-Persian Wars. 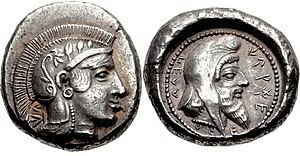 Dynast of Lycia, Kherei, with Athena on the obverse, and himself wearing the Persian cap on the reverse. Circa 440/30–410 BC. 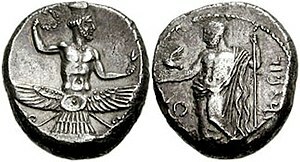 Coinage of Tiribazos, Satrap of Lydia, with Ahuramazda on the obverse. 388–380 BC. Repeatedly defeated in battle by the Greeks, and plagued by internal rebellions that hindered their ability to fight the Greeks, after 449 BC, Artaxerxes I and his successors instead adopted a policy of divide-and-rule. Avoiding fighting the Greeks themselves, the Persians instead attempted to set Athens against Sparta, regularly bribing politicians to achieve their aims. In this way, they ensured that the Greeks remained distracted by internal conflicts, and were unable to turn their attentions to Persia. There was no open conflict between the Greeks and Persia until 396 BC, when the Spartan king Agesilaus briefly invaded Asia Minor; as Plutarch points out, the Greeks were far too busy overseeing the destruction of their own power to fight against the "barbarians". ^ ii: Archaeological evidence for the Panionion before the 6th century BC is very weak, and possibly this temple was a relatively late development. ^ Ehrenberg, Victor (2011). From Solon to Socrates: Greek History and Civilization During the 6th and 5th Centuries BC (3 ed.). Abingdon, England: Routledge. pp. 99–100. ISBN 978-0-41558487-6. ^ Roisman & Worthington 2011, pp. 135-138. ^ a b Sealey, p. 248. ^ a b c d e f g h Fine, p. 360. ^ a b Holland, pp. 9–12. ^ a b Holland, pp. 147–151. ^ a b Holland, pp. 155–157. ^ LacusCurtius • Herodotus — Book V: Chapters 55‑96. ^ a b c d e Waters, Matt (2014). Ancient Persia: A Concise History of the Achaemenid Empire, 550–330 BCE. Cambridge University Press. p. 84-85. ISBN 9781107009608. ^ a b Waters, Matt (2014). Ancient Persia: A Concise History of the Achaemenid Empire, 550–330 BCE. Cambridge University Press. ISBN 9781107009608. ^ a b Holland, pp. 153–154. ^ Boardman et al, pp. 481–490. ^ a b Holland, pp. 175–177. ^ Roisman & Worthington 2011, p. 343. ^ a b Holland, pp. 181–183. ^ a b Holland, pp. 183–186. ^ a b Holland, pp. 195–197. ^ a b Holland, pp. 202–203. ^ a b Holland, pp. 208–211. ^ de Souza, p. 41. ^ a b Lazenby, pp. 93–94. ^ a b c Holland, pp. 214–217. ^ a b c Holland, pp. 219–222. ^ a b Holland, pp. 327–329. ^ a b Holland, pp. 333–335. ^ a b c Fine, p. 331. ^ a b Fine, pp. 338–339. ^ a b c Holland, p. 362. ^ a b Sealey, p. 280. ^ a b Sealey, p. 282. ^ a b c Dandamaev, p. 256. Boardman J; Bury JB; Cook SA; Adcock FA; Hammond NGL; Charlesworth MP; Lewis DM; Baynes NH; Ostwald M; Seltman CT (1988). The Cambridge Ancient History, vol. 5. Cambridge University Press. ISBN 0-521-22804-2. Roisman, Joseph; Worthington, Ian (2011). A Companion to Ancient Macedonia. John Wiley and Sons. ISBN 978-1-44-435163-7. Retrieved 2016-03-14. Rung, Eduard (2008). "Diplomacy in Graeco–Persian relations". In de Souza, P; France, J (eds.). War and peace in ancient and medieval history. University of California Press. ISBN 0-521-81703-X. Thomas, Carol G.; Conant, Craig (2003). Citadel to City-State: The Transformation of Greece, 1200–700 B.C.E. Indiana University Press. ISBN 0-253-21602-8. Wikimedia Commons has media related to Greco–Persian Wars.